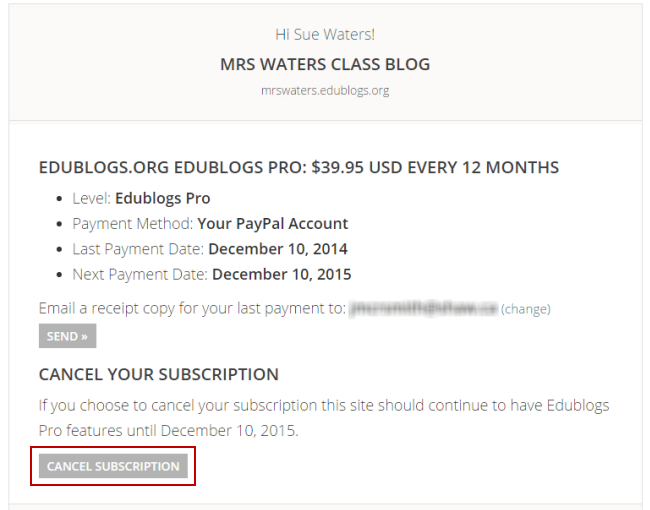 Edublogs Pro is designed to automatically renew unless you cancel your subscription prior to the next payment date. 1. Log into your blog dashboard. 2. Click on the orange +Pro Account button at the upper right-hand corner of your dashboard. 3. This takes you to your Pro account page where you can view your transaction history, change and cancel your subscription. 4. Scroll down the page and click on Cancel Subscription. When you cancel your subscription it doesn’t immediately cancel your Pro blog features. Your blog will remain a Pro blog until the date your current subscription expires. Please contact Edublogs support if you don’t see an option to cancel subscription on your Pro Account page so we can cancel your subscription.